Call 713-234-6346 for effective, efficient Internet marketing for your business. IX Brand SEO Services wants to “ride for your brand”! 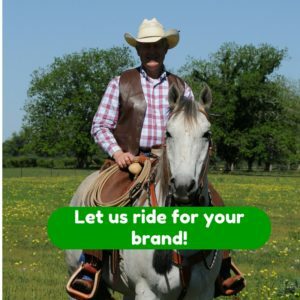 Let IX Brand SEO ride for your brand! – – Howdy folks, my name is Paul Sherland from IX Brand SEO Services. I’m out in the middle of the horse pasture this evening to talk a little bit about IX Brand SEO’s content marketing process and SEO process. What we do and give you some idea of my background and the company’s background. If you’re going to believe that, I wish you luck. We’ve found that the best way to get good rankings, is to give Google what it wants, and Google’s looking for high quality content to provide that content to internet searchers. People go to Google to get good answers, to get good information, to get expert information. So, if you’re a purveyor of knowledge about your products or services — if you can provide that high quality information — then Google will reward you with high rankings. If you’re an expert in your business, in your service, or in your products, and you’re willing to help us convey that expertise online, you will be rewarded. Now, there are folks out there who will say we can just get you a great ranking through a link building campaign, or through guest posting on a blog, or something like that and that may be helpful if your content is great. That may be a little bit of icing on the cake. But if you have bad content, or if the content isn’t special, then Google’s not going to reward you no matter how many links you have, at least not in the long term, and Google’s not going to reward you if you’re guest posting on nameless blogs all over the world — they don’t care. If you provide that great content, Google will find you and reward you. So, if you’re willing to work with IX Brand SEO Services in developing great content, you can give me a call. If you’re willing to find out more, please give me a call at 713-234-6346 or send me an email through the contact form. Now, you may be wondering what my background is. I’ve been working in computers for many, many years. I graduated from the US Naval Academy and majored in Physics. I worked for many years in science and technology and especially in computer simulation. I have a Masters degree in Operations Research, and my thesis was a computer simulation. I was also a helicopter pilot and commanded a helicopter squadron in the Navy. I worked as a defense contractor after I left the Navy and also went to law school. I’m a graduate of a top 10 law school with honors. So, I’m used to language, too. It’s not only the technology, it’s not only the computers, but you need to be able to express yourself online, you need to do that in a persuasive way, and that legal background helps me help you do that. If you’re interested in working with us, please give me a call at 713-234-6346. Again, or send me an email through the contact form. Thanks for your time and attention, and have a great day.